After city and state officials took the maximum position to protect the safety and well-being of citizens, the anticipated “Blizzard of the Century” turned into more like the blizzard of the week. On Tuesday New York City Mayor Bill de Blasio said that he does not regret closing schools and ordering all traffic off the streets beginning at 11pm, just ahead of the storm. Closure of the subway, however, was not mandated by the mayor’s office. "We found out just as it was being announced," the mayor said, only 15 minutes before Governor Cuomo made the announcement on TV on Monday afternoon that for the first time in the 110-year history of the subway it would be closed for snow. "I think it was a very big move, and certainly something we would have liked to have had some more dialogue on," said de Blasio. He did not say whether he agreed with the decision or not. The Mayor explained that New Yorkers should consider themselves lucky that we received only 10 to 12 inches of snow on Monday night, a half to a third of what was forecast. "Just 20, 30 miles east of the city's border, in Long Island, they got exactly what was originally projected for here," de Blasio said. "These were the right precautions to take. 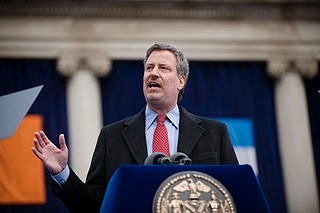 They worked," de Blasio said. "I will always err on the side of safety and caution," he said.